The horrors of Yemen’s civil war have been encapsulated by photographs showing a toddler suffering from severe malnutrition. UNICEF estimates that 320,000 children are facing starvation, while over two million youngsters need urgent assistance. The images, which were captured by a Reuters photographer, show the six-year-old boy Salim Musabih sitting on a bed beside his mother. His bones and ribcage stick out from under his skin as he sits in just his nappy. 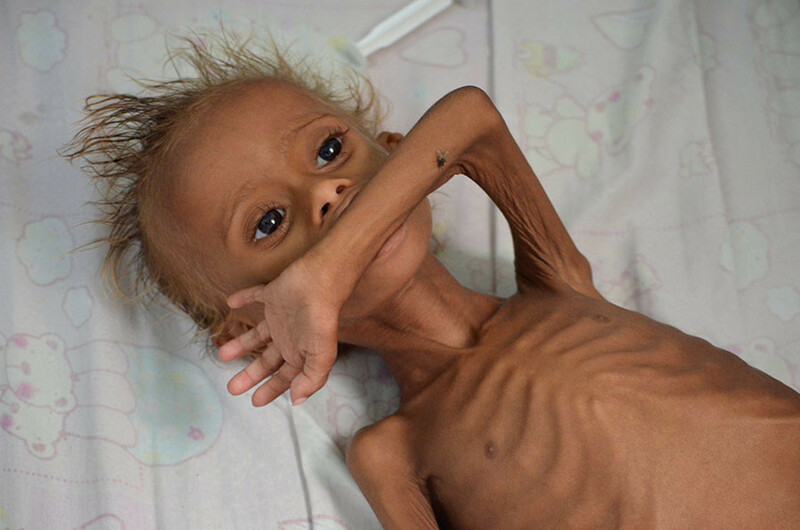 In another photograph, which was taken in the port city of Al-Hudaydah, the toddler’s arm is so thin that he is able to wrap his lips around it. The size of a fly on his left arm in comparison to the size of the limb itself also portrays just how dire his condition is. “They came from a destroyed area where there is no food, pure water or infrastructure. They were starving, the only food they had was from the sea,” hospital volunteer Ibrahim Al Kalee told UAE’s 7days newspaper. The boy is said to have arrived at the Al-Thawra Hospital with his mother, after the village they were living in was struck by severe food shortages due to a lack of imports, caused by the security situation. 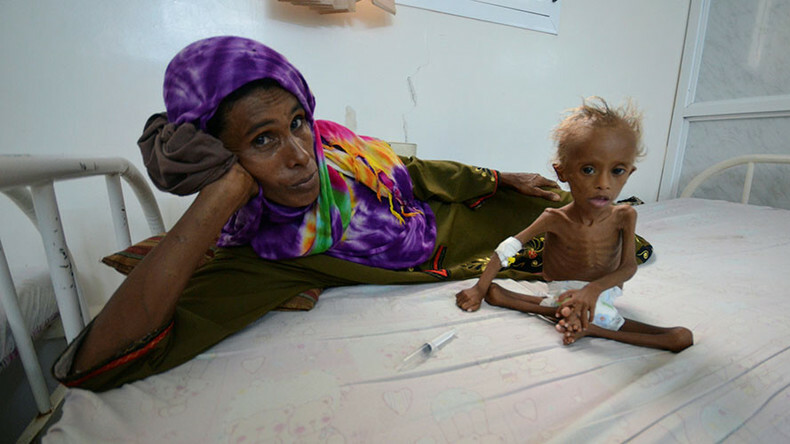 “The children are suffering from Severe Acute Malnutrition (SAM) in Hodeida governorate,” said Rajat Madhok, Chief of Communication and Advocacy at UNICEF Yemen told the daily. Salim is just one of 320,000 youngsters who are suffering from severe malnutrition, according to a UNICEF report published in August. The UN children’s agency added that 2.2 million kids are in need of urgent humanitarian assistance. Poor sanitation and lack of access to clean water are widespread in the country, which has increased health risks for children. Shortages of fuel have also made it hard to deliver water to one of the most water-scarce countries on the planet, according to UNICEF. On September 10, 30 people were killed after several airstrikes on a water well in a village in Sana’a governorate, which was condemned by the UN’s top humanitarian official in Ymen. “I remain deeply disturbed by the unrelenting attacks on civilians and on civilian infrastructure throughout Yemen by all parties to the conflict, which are further destroying Yemen’s social fabric and increasing humanitarian needs, particularly for medical attention at a time when the health sector is collapsing,” the UN Humanitarian Coordinator in Yemen, Jamie McGoldrick said on Tuesday. The conflict has been raging for 18 months and has been worsened by often indiscriminate airstrikes conducted by the Saudi-led coalition against Houthi rebel forces. “We have seen for example attacks against schools rendering them unusable so that children have not been able to start the academic year,” Lama Fakih, a senior crisis adviser at Amnesty International told RT in August. “We’ve seen the Saudis also use a banned cluster munitions which act as landmines when they are left in civilian areas and are particularly problematic for children, who mistake them for toys and move them around and end up being casualties of this weapons,” she added. Yemen’s civil war has cost the country $14 billion so far, according to a confidential joint report compiled by the World Bank, UN, the Islamic Development Bank, and the European Union.